In recent years there has been a renewed interest in, and appreciation of, garden benches. This is even more apparent when it comes to engraving on benches. 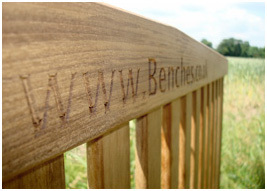 People enjoy adding personal touches to their garden and an engraving on a bench is one way of doing this. Most people associate bench engravings with memorials of people who have died, but there are lots of other reasons why people like engraved benches. Whether you want to remember a person, a pet, or a special day, an engraving is a great way of doing this, and it’s also somewhere for you to relax with a drink after work. You will often find engraved park benches in public spaces and organisations may have benches on their business forecourt that have their company name engraved on them. Engraving is done with a precision machine and overseen by a highly skilled craftsman. Engraved benches are a constant reminder of happy memories and will bring you lasting pleasure. Memorial benches in a variety of styles are often seen in parks and on towpaths, wherever people are likely to stroll in fact. Beautifully engraved benches provide a memorial to someone who has passed on, keeping their memory alive in the public imagination. An increasing number of people now choose to have engravings on benches with the name of a deceased relative or a much loved pet and these make wonderful places to sit and remember that person or pet and the happy times you had with them. Teak benches have gained considerable popularity in recent years. No matter what style of bench you prefer, the beautiful smoothness and glow of teak wood is something many people appreciate. Teak benches are extremely durable and require little maintenance other than the occasional oiling to keep them looking good. Whether you prefer a classic garden bench or something a bit more contemporary, there is a wide choice of teak garden benches available, so you are sure to find something to suit your particular taste.